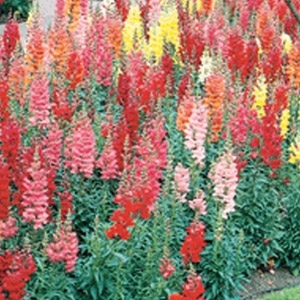 Sonnet Mix Snapdragons are a taller variety that makes beautiful backdrops for shorter plants. The mix contains dark red, yellow, white, pink and orange shades. Snapdragons do best when the weather is cool but will stop blooming when the weather gets hot. When it cools off again they resume blooming. 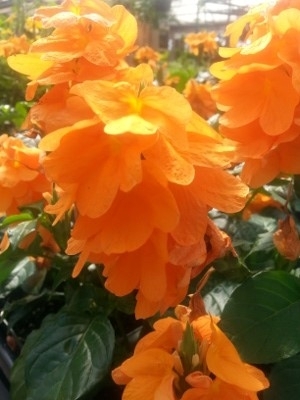 Nirvana™ was bred for both its resistance to wet conditions and for extreme heat tolerance. 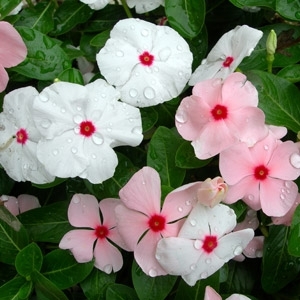 Paired with the large flowers and overlapping pedals, Nirvana™ is simply the best Vinca on the market. 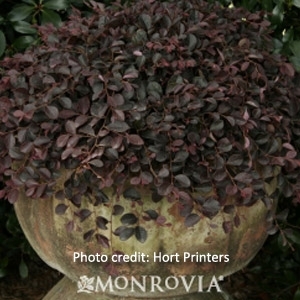 Plant this tough, sun-loving ornamental in beds, borders or containers and in butterfly gardens. Traditionally, topiaries are made from plants like ivy, boxwood, and myrtle, but they can be created from just about any woody perennial. 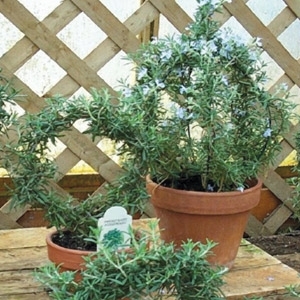 Potted rosemary trimmed into an elongated pyramid looks elegant in the garden or adds a welcoming fragrance to front entrance. An upright growing Hosta reaching to 18 to 24 inches tall and wide. Foliage is dark green with white centers and lavender blooms in summer. Needs good morning sun or steady filtered shade to maintain its vigor. This plant is slug resistant and a moderate grower. 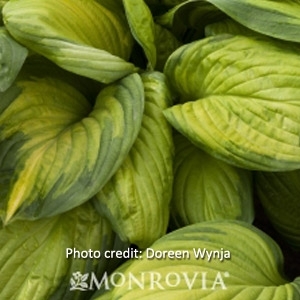 Francee is a medium-sized Hosta that grows 2 feet tall and 4 feet wide. Wonderful white margins contrast with the green heart-shaped leaves. It produces lavender flowers in late summer and performs well in sun or shade. Upright shape with large bright green foliage. Huge fragrant white flowers adorn this plant in mid-summer. Royal Standard will tolerate full sun if kept moist and it grows rapidly. Average mature height 24 inches with a spread of 48 inches. Very showy profusion of pure white blooms top neat, low mounds in spring. Reaches 12 inches tall and 24 inches wide. Its spreading form is excellent for edging, in borders or as a rock garden accent. Distinctive mounds of airy, fern-like leaves contrast with richly colored flowers in early summer. Matures at 2 feet tall and wide. Needs moist, well-drained, and rich soil. Attractive to hummingbirds. 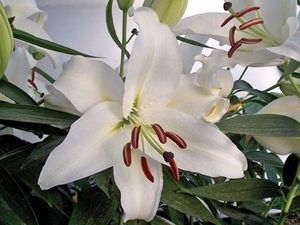 The Oriental White Stargazer Lily requires full sun exposure, needs average moisture and attracts butterflies! This White Stargazer Lily has a medium growth rate and the bulbs bloom in late Summer. 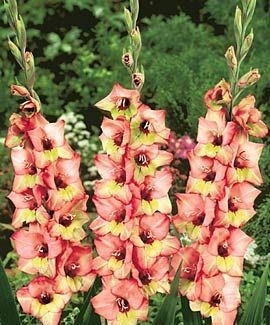 These Gladiolus begin with a beautiful red bloom that slowly fades into a pink shade between July - August. The Aftershock Gladiolus are perennials that needs regular watering, sun exposure and average soil needs. Enjoy three seasons of neon-bright color from this hardy, sun-loving succulent. Exceptionally drought, heat and humidity tolerant. Forms a lush, ground hugging mat, good for mass planting and erosion control in lean, poor soils. Great container or rock garden accent. Evergreen. Bright golden leaves with wide, deep green margins and prominent veining provide the appearance of stained glass. Large, fragrant pale lavender flowers complement the dramatic foliage. Bold color for foundation and woodland beds. Herbaceous perennial. 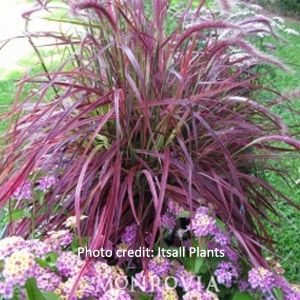 Compact, weeping habit of rich purple foliage is the perfect backdrop for clusters of hot pink, fringe-like flowers that repeat throughout the year. A superb colorful accent in borders and containers. At home in Asian and contemporary gardens. Evergreen. Colorful, upright growing grass with variegated stripes of white, green, burgundy and hot pink running the length of the blade. Purple tassles appear in summer. Plant as a specimen or in mass for a stunning display of color. A great addition to containers and beds near your patio or deck. 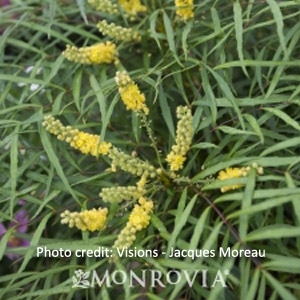 Lemon-yellow flowers stand atop the slender, thornless, bamboo-like foliage in early winter. Flowers are followed by large clusters of silver-blue berries in spring. Perfect for an Asian garden, border planting, or as a specimen. Evergreen. This new introduction is an outstanding cultivar! This dwarf clumping lantana stays a compact 2'x2'. The continual masses of flowers open to a vibrant true red. It is perfect for small spaces or plant in groups for a spectacular show. 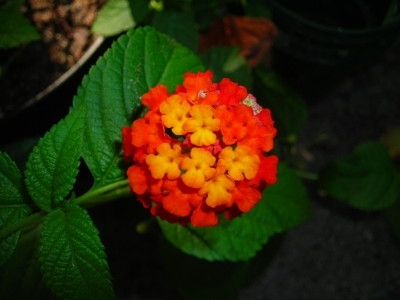 Hummingbirds and butterflies love the 'Ally Klaire' Lantana. For the best color plant it in full sun. A mix of pink, red, yellow, orange, purple and white 3 to 3.5-inch blooms flower at different heights from mid-summer to early fall. A well-branched, upright growth habit reaches 2 feet tall and wide. Great for landscapes or cut flowers. This purple coneflower may be only knee high, but it's still a rugged and dependable performer for sunny landscapes. 'Kim's Knee High', as the name suggests, grows only 18 to 24 inches tall. It is covered with traditional pink daisy-like flowers up to 6-inches across. Flower petals are drooping and flexed with orange center cones. 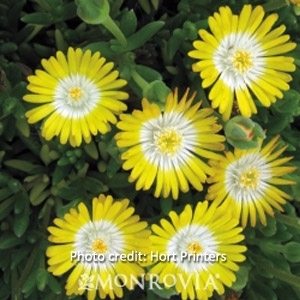 This native perennial thrives in drought conditions. It is great for small areas and containers. A fast growing evergreen shrub that can reach 5 to 8 feet tall and 6 to 8 feet wide. Its big, dark green, deeply lobed, and fan-like leaves give it a tropical appearance. Round clusters of small whitish flowers appearing in fall/winter are followed by clusters of small black fruit.